United Airlines is showing 2-in-1 flights that allow you to spend time in both Tokyo, Japan and Hong Kong for $602 CAD roundtrip including taxes. 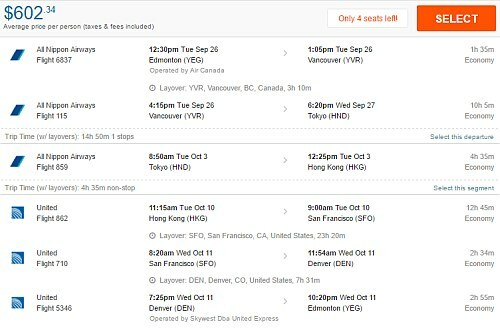 You would fly from Edmonton to Tokyo, Japan (spend time there) and then fly from Tokyo to Hong Kong (spend time there), and then fly home from Hong Kong to Edmonton. NOTE: Most of these flights are operated by United Airlines, but some are operated by ANA in at least one direction. If you can find any with overseas flights that are actually operated by ANA in at least one direction, definitely go for those, as they are a great airline (ranked #3 in the world this year). If you see any that are operated by ANA in both directions, please share the dates the comments! You can try many other dates in September and the first half of October. You do need to depart in September however. 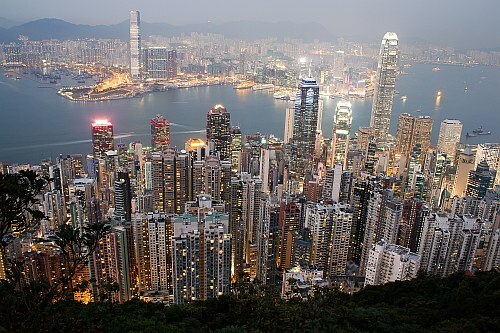 Update 8/24 - There are still a few really cheap flights from Edmonton to Hong Kong out there for $490 CAD roundtrip including taxes. NOTE: Once your Momondo search completes, use the Max Flight Duration slider on the left and slide it down to about 48. Otherwise you will see flights for $20 less that are far longer in duration. They should look like the flights in the screenshot below.